The tendency to overuse the mouth comes easy to most people. Mindless snacking, guzzling sugary beverages or simply jabbering away without thinking is considered ‘being cool’. Oral Health is not top of the charts for most. The brushing of teeth is simply one of the irksome habits that they reluctantly buy into (perfunctorily) during their growing up years, motivated by the belief that it will help them avoid painful visits to the dentist and/or enhance their social acceptance (courtesy a fresh breath and an attractive smile). A naive reliance on fads like expensive toothpastes or mouth fresheners is still very much the norm. Not surprisingly, sooner rather than later, tooth decay and gum disease set in. The response more often than not is to look for quick fixes, such as cavity fillings, dental implants or dentures. Like many areas of the body, the mouth is teeming with bacteria. Some are harmless, while many others can be devastating to the body’s natural defences. Only in very recent times have we fully understood how periodontal health can offer important clues about our overall health - just like the holding up of a mirror, the health of the mouth can be a good indicator of the general condition of the body. Early indicators of serious diseases can sometimes first be seen in the mouth. A consensus report from the American Academy of Periodontology (AAP) and the European Federation of Periodontology (EFP) suggests that periodontal health may play an important role in the management of diabetes. Periodontal disease has also been linked to other systemic diseases, including cardiovascular disease, rheumatoid arthritis and Alzheimer’s disease. In the western world, up to 50% of adults suffer from gum disease, and these people are twice as likely to suffer from heart problems. Once the natural anti-microbial activity of the body is compromised, teeth and gum disease set is. This is mostly triggered by a deficiency of saliva and an overly acidic environment in the mouth. Saliva is key for washing away food and neutralising acids produced by bacteria in the mouth. Acids chip away the enamel and corrode the surface of teeth, making it easy for harmful bacteria to dig in deep. Plaque accumulation and weakening of the underlying support structures of the teeth only worsens the situation. Eating a wide variety of fresh foods and whole grains provides the much needed exercise for the teeth and gums, while at the same time providing essential vitamins and minerals. Vitamin C is particularly important. Vitamin A is also necessary for gum health as well as for healthy tooth development in children. Minerals that are key are sodium, potassium, calcium, phosphorous, iron and magnesium. Sugar, as also all refined carbohydrates, is one of the main causes of dental problems - leading to plaque build-up and inhibiting the natural defences of the body. Sticky sugared candy is one of the worst offenders. In addition, highly acidic colas, sports drinks, pickles, ketchups and balsamic vinegar open up the pores of tooth enamel, allowing for easy incursion of bacteria. Medications – such as decongestants, antihistamines, painkillers and diuretics – also reduce the flow of saliva and are detrimental to Oral Health. Teeth staining foods are coffee, tea, red & white wine, dark berries, beets, deeply coloured sauces and juices, yellow-staining food spices or flavours (like turmeric or curry) and colourful candy. Pineapple can act as a natural stain remover. In addition to regular brushing, preferably after every meal, there are a few other steps that can help ensure robust Oral Health – like dental flossing, scraping the tongue and using a water-pik or any soft brush to flush out the debris stuck between teeth. Once-in-six months cleaning by a dental professional can help get to the more difficult parts. ‘Oil pulling’ is an ancient Ayurvedic technique, which involves swishing a tablespoon of cold-pressed oil around in the mouth every morning for 20 minutes. There is an increasing body of evidence to support this practice. It purportedly ‘pulls’ the toxins out, drawing them into the oil. Coconut oil or sesame oil are considered the best for this practice. A balanced and nutritious diet is good for general health as well as for dental health. Without the right nutrients, teeth and gums can become more susceptible to decay and gum disease. Vitamin C is very important for the overall health of gum tissue, as it helps to prevent collagen from breaking down. Amla (Indian gooseberry), Kiwis, strawberries and citrus fruits have the highest concentration of Vitamin C. These fruits do double duty, because of their astringency, which may help to reverse discoloration. The well-known Rasayana herb, Amla, is considered a general rebuilder of Oral Health. Cloves are high on antioxidants and are a time-tested spice for improving Oral Health. Carrots contain Vitamin A, which is needed for healthy tooth enamel. Green vegetables like broccoli, lettuce and spinach contain iron, which helps form an acid-resistant film or barrier that can help scrub away stubborn stains and protect the enamel. Apples, celery, pears, guavas, cauliflower, cucumber and low-acid fibrous foods are sometimes called ‘dental detergents’, as these can stimulate saliva production, which in turn keeps oral bacteria in check. A celery stick can be like a mini gym workout for your gums - the saliva produced in the process, and the scrubbing action, cleanses the mouth. In some countries, chewing of herbal sticks in the morning as well as after every meal is a favored practice - fresh stems of Neem margosa (Azadiraxhta indica) as also Miswak (Salvadora persicaor) and the arak/peelu tree are some of the favoured varieties. These also feature in well-known herbal dental creams and powders. Nuts and seeds contain powerful teeth-healthy micronutrients - such as phosphorous, magnesium, potassium, zinc and, most importantly, calcium - which may contribute to tooth re-mineralisation. 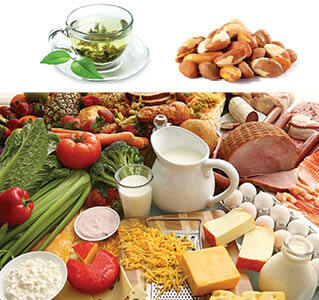 The highest in calcium content are almonds, brazil nuts and sesame seeds. Thanks to antimicrobial sulphur-containing compounds, raw onions help reduce the bacteria that cause tooth decay. Similarly, ginger is an anti-inflammatory agent that can support healthy mouth tissue. Basil is a natural antibiotic that reduces bacteria in the mouth. Being anti-inflammatory as well as anti-microbial, the catechin content of Green Tea also helps. Shiitake mushrooms contain lentinan, a natural sugar that may help to prevent gingivitis – which is characterised by redness, swelling and bleeding of the gums. Lentinan specifically targets cavity-causing bacteria, while leaving non-harmful bacteria completely unaffected. Cheese is rich in protein, calcium and phosphorus, all of which can help safeguard against the acids in the mouth. Casein (milk protein) contained in cheese strengthens the surface of the teeth. In fact, when had after meals, Cheddar can enhance the environment for beneficial bacteria to grow. Plain yoghurt is wonderful when it comes to smile-enhancing foods. In addition to casein and calcium, yoghurt helps improve digestion, which in turn leads to fresh breath. There is some interesting work going on in the use of Probiotics in Oral medicine. According to Ayurveda, herbs taken internally to strengthen Astidhatu - the skeleton and the joints - are good for the long term health of the teeth. Some examples of these herbs are: yellow dock root, alfalfa leaf, cinnamon bark and turmeric root. Bilberry fruit and hawthorn berry also help stabilise collagen and strengthen gum tissue.